The Holy Grail is a mythical object or symbol associated with Jesus Christ. 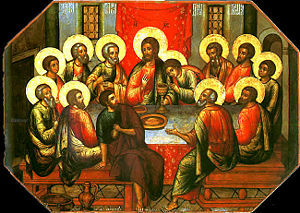 In earliest Grail literature, it was described as the dish, plate, or cup used by Jesus at the Last Supper, and was said to possess miraculous powers. The legend may combine Christian lore with a Celtic myth of a cauldron endowed with special powers. The quest for the Holy Grail makes up an important segment of the Arthurian cycle, appearing first in works by Chrétien de Troyes. The early Grail romances centered on Percival and were woven into the more general Arthurian fabric, in which other knights such as Sir Galahad played a prominent role. It was connected with Joseph of Arimathea in the writing of Robert de Boron in the late-twelfth century, in which Joseph receives the Grail from an apparition of Jesus and sends it to Great Britain. Building upon this theme, later writers recounted how Joseph used the Grail to catch Christ's blood, and still later theorists have suggested that the Grail is actually a symbol for Jesus own blood-line, with Mary Magdalene as the initial "vessel" symbolized by the Grail. The development of the Grail legend has been traced in detail by cultural historians. It is a legend which first came together in the form of written romances, deriving perhaps from some pre-Christian folklore, in the later twelfth and early thirteenth centuries. The Grail was considered a bowl or dish when first described by Chrétien de Troyes. Other authors presented it differently. The word graal, as it is earliest spelled, appears to be an Old French adaptation of the Latin gradalis, meaning a dish brought to the table in different stages of a meal. Late medieval writers spoke of the sangréal or "Holy Grail," related to an Old French, word meaning "royal blood." 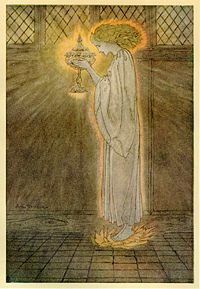 The Grail plays various roles in the stories concerning it, but in most versions of the legend the hero must prove himself worthy to be in its presence. In the early tales, Percival's immaturity prevents him from fulfilling his destiny when he first encounters the Grail, and he must grow spiritually and mentally before he can locate it again. In later tellings the Grail is a symbol of God's grace, available to all but only fully realized by those who prepare themselves spiritually, like the saintly Galahad. There are two veins of thought concerning the Grail's origin. The first holds that it derived from early Celtic myth and folklore. On the other hand, some scholars believe the Grail began as a purely Christian symbol. For example, Joseph Goering of the University of Toronto has identified sources for Grail imagery in twelfth-century wall paintings from churches in the Catalan Pyrenees, which present unique iconic images of the Virgin Mary holding a bowl that radiates tongues of fire. Another recent theory holds that the earliest stories that cast the Grail in a Christian light were meant to promote the Roman Catholic sacrament of the Holy Communion. This theory has some basis in the fact that the Grail legends are a phenomenon of the Western church. Most scholars today accept that both Christian and Celtic traditions contributed to the legend's development. The general view is that the central theme of the Grail is Christian, even when not explicitly religious, but that much of the setting and imagery of the early romances is drawn from Celtic material. 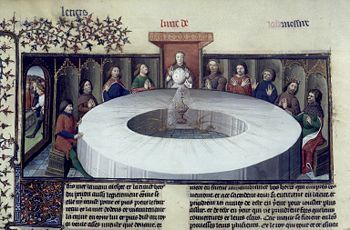 The Grail is first featured in Perceval, le Conte du Graal (The Story of the Grail) by Chrétien de Troyes, who claims he was working from a source book given to him by his patron, Count Philip of Flanders. In this incomplete poem, dated sometime between 1180 and 1191, the object has not yet acquired the implications of holiness it would have in later works. While dining in the magical abode of the Fisher King, Perceval witnesses a wondrous procession in which youths carry magnificent objects from one chamber to another, passing before him at each course of the meal. First comes a young man carrying a bleeding lance, then two boys carrying candelabras. Finally, a beautiful young girl emerges bearing an elaborately decorated graal. Chrétien refers to his object not as la graal, a common noun. For Chrétien the grail was a wide, somewhat deep dish or bowl, often used for fish dishes such as pike, salmon, or lamprey, but here containing a single communion wafer which provided sustenance for the Fish King’s crippled father. Perceval, who had been warned against talking too much, remains silent through all of this, and wakes up the next morning alone. He later learns that if he had asked the appropriate questions about what he saw, he would have healed his maimed host, much to his honor. Chrétien may actually have intended the eucharist wafer to be the significant part of the story, and the Grail to be a mere prop. Though Chrétien’s account is the earliest and most influential of all Grail texts, it was in the work of Robert de Boron that the Grail became the "Holy Grail" and assumed the form most familiar to modern readers. In his verse romance Joseph d’Arimathie, composed between 1191 and 1202, Robert tells the story of Joseph of Arimathea acquiring the chalice of the Last Supper to collect Christ’s blood upon His removal from the cross. Joseph is thrown in prison where Christ visits him and explains the mysteries of the blessed cup. Upon his release Joseph gathers his in-laws and other followers and travels to the West, and founds a dynasty of Grail keepers that eventually includes Perceval. After this point, Grail literature divides into two classes. The first concerns King Arthur’s knights visiting the Grail castle or questing after the Grail itself. The second concerns the Grail’s history in the time of Joseph of Arimathea. Though all these works have their roots in Chrétien, several contain pieces of tradition not found in Chrétien which are possibly derived from earlier sources. Four continuations of Chrétien’s poem by authors of differing vision, designed to bring the story to a close. The German Parzival by Wolfram von Eschenbach, which adapted the holiness theme of Robert de Boron’s Grail into the framework of Chrétien’s story. The Didot Perceval, named after the manuscript’s former owner. The Welsh romance Peredur, generally included in the Mabinogion, indirectly founded on Chrétien's poem, but including very striking differences from it, preserving elements of pre-Christian traditions. The German Diu Crône (The Crown), in which Gawain, rather than Perceval, achieves the Grail. Belief in the Grail and interest in its potential whereabouts has never ceased. Ownership has been attributed to various groups (including the Knights Templar, probably because they were at the peak of their influence around the time that Grail stories started circulating in the twelfth and thirteenth centuries). Saint Mary of Valencia Cathedral in Spain contains an artifact known as the Holy Chalice. 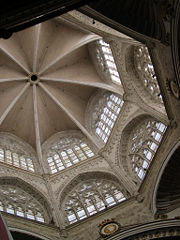 There are cups claimed to be the Grail in several churches, for instance the Saint Mary of Valencia Cathedral, which contains an artifact, the Holy Chalice, supposedly taken by Saint Peter to Rome in the first century, and then to Huesca in Spain by Saint Lawrence in the third century. Archaeologists say the artifact is a first-century Middle Eastern stone vessel, possibly from Antioch, Syria (now Turkey); its history can be traced to the eleventh century, and it presently rests atop an ornate stem and base, made in the Medieval era of alabaster, gold, and gemstones. It was the official papal chalice for many popes, and has been used by many others, most recently by Pope Benedict XVI, on July 9, 2006. The emerald chalice at Genoa, which was obtained during the Crusades at Caesarea Maritima at great cost, has been less championed as the Holy Grail since an accident on the road, while it was being returned from Paris after the fall of Napoleon, revealed that the emerald was green glass. In Wolfram von Eschenbach's telling, the Grail was kept safe at the castle of Munsalvaesche (mons salvationis), entrusted to Titurel, the first Grail King. Some, not least the monks of Montserrat, have identified the castle with the real sanctuary of Montserrat in Catalonia, Spain. Other stories claim that the Grail is buried beneath Rosslyn Chapel or lies deep in the spring at Glastonbury Tor. Still other stories claim that a secret line of hereditary protectors keep the Grail, or that it was hidden by the Templars in Oak Island, Nova Scotia's famous "Money Pit," while local folklore in Accokeek, Maryland says that it was brought to the town by a closeted priest aboard Captain John Smith's ship. Robert de Boron portrayed it as the vessel of the Last Supper, and Peredur had no Grail per se, presenting the hero instead with a platter containing his kinsman's bloody, severed head. In Parzival, Wolfram von Eschenbach, claimed the Grail was a stone that fell from Heaven, and had been the sanctuary of the Neutral Angels who took neither side during Lucifer's rebellion. The authors of the Vulgate Cycle used the Grail as a symbol of divine grace. Here, Galahad, the illegitimate son of Lancelot and Elaine, is destined to achieve the Grail, his spiritual purity making him a greater warrior than even his illustrious father. The Galahad tradition was popularized in the fifteenth century by Sir Thomas Malory in Le Morte d'Arthur, and remains popular today. 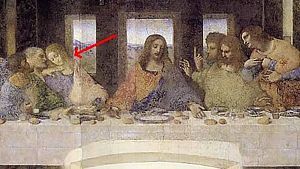 Da Vinci's depiction of John, the Beloved Disciple, is thought by some to actually be Mary Magdalene, Jesus' secret wife and the true "vessel" symbolized by the Grail. For the authors of Holy Blood, Holy Grail—who assert that their research reveals that Jesus may not have died on the cross but lived to wed Mary Magdalene and father children whose Merovingian lineage continues today—the Grail is actually symbolic of Magdalene herself as the receptacle of Jesus' bloodline. According to the controversial Italian traditionalist philosopher Julius Evola (1898-1974), the Holy Grail was an initiatory "Hyperborean mystery" and also "a symbolic expression of hope and of the will of specific ruling classes in the Middle Ages, who wanted to reorganize and reunite the entire Western world as it was at that time into a Holy Empire based on a transcendental, spiritual basis." Graham Hancock asserts in The Sign and the Seal that the Grail story is a coded description of the stone tablets stored in the Ark of the Covenant. In their book Swords at Sunset, Canadian authors Michael Bradley and Joelle Lauriol connect the Grail to the legend that Henry Sinclair came to the Americas (specifically Lake Memphremagog in Vermont 100 years before Columbus. In an argument drawing more closely on earlier "pro-Celtic" research, English author John Grigsby attempts to connect themes of the Grail to Indo-European myths, including Osiris, Adonis, and the Greek Dionysos in his book Warriors of the Wasteland. The story of the Grail and of the quest to find it became increasingly popular in the nineteenth century, referred to in literature such as Alfred Tennyson's Arthurian cycle the Idylls of the King. 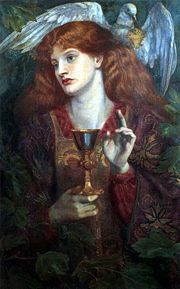 The high seriousness of the subject was also epitomized in Dante Gabriel Rossetti's painting, in which a woman modeled by Jane Morris holds the Grail with one hand, while adopting a gesture of blessing with the other. Other artists, including George Frederic Watts and William Dyce also portrayed grail subjects. The Grail later turned up in movies; it debuted in a silent Parsifal. In The Light of Faith (1922), Lon Chaney attempted to steal it, for the finest of reasons. Lancelot du Lac (1974) is Robert Bresson's gritty retelling. In vivid contrast, Monty Python and the Holy Grail (1975) deflated all pseudo-Arthurian posturings. Indiana Jones and the Last Crusade and The Fisher King place the quest in modern settings; one a modern-day treasure hunt, the other robustly self-parodying. The Grail has been used as a theme in fantasy and science fiction; Michael Moorcock's fantasy novel The War Hound and the World's Pain depicts a supernatural Grail quest set in the era of the Thirty Years' War, and science fiction has taken the Quest into interstellar space, figuratively in Samuel R. Delany's 1968 novel Nova, and literally on the television shows Babylon 5 and Stargate SG-1. The grail features heavily in the novels of Peter David's Knight trilogy, which depict King Arthur reappearing in modern-day New York City. The Grail is also central in many modern Arthurian works, including Charles Williams collections of poems about Taliessin, and in feminist author Rosalind Miles' Child of the Holy Grail. These works of non-fiction have inspired a number of works of modern fiction. The best known is Dan Brown's bestselling novel The Da Vinci Code, which, like Holy Blood, Holy Grail, is based on the idea that the real Grail is not a cup but the womb and later the earthly remains of Mary Magdalene, though which Jesus' descendants live on. In Brown's novel, it is hinted that the Grail was long buried beneath Rosslyn Chapel in Scotland, but that in recent decades its guardians had it relocated to a secret chamber embedded in the floor beneath the Inverted Pyramid near the Louvre Museum. ↑ H. T. Hansen. The Mystery of the Grail. , vii. ↑ Michael Bradley and Joelle Lauriol. 2005. Swords at Sunset: Last Stand of North America's Grail Knights. (Ancaster, Ontario: Manor House. ISBN 0973647744). ↑ John Grigsby. Warriors of the Wasteland: A Quest for the Pagan Sacrificial Cult Behind the Grail Legends. (London: Duncan Baird Publishers, 2003). Bradley, Michael and Joelle Lauriol. 2005. Swords at Sunset: Last Stand of North America's Grail Knights. Ancaster, Ontario: Manor House. ISBN 0973647744. The Holy Grail at the Camelot Project. www.lib.rochester.edu. The Holy Grail at the Catholic Encyclopedia. www.newadvent.org. The Holy Grail today in Valencia Cathedral. www.valenciavalencia.com. This page was last modified on 12 January 2018, at 15:44.